The site of the present day St. Lawrence neighbourhood was created from landfill in the early 1800’s. It was originally intended to serve as a public promenade with a grand Esplanade along the waterfront. However the city turned the land over to the railways, which in turn attracted industry to the St. Lawrence area. By the early 1900’s, St. Lawrence had become one of Toronto’s most prominent industrial centres. It remained a vital industrial area until the late 1940’s, when Toronto’s industrial base began moving outside of the city. Consequently, St. Lawrence went into a period of decline which lasted until the 1970’s, when Toronto politicians made the decision to create the present day St. Lawrence neighbourhood. Planned and developed by the City of Toronto in the 1970’s as a mixed use housing development, the St. Lawrence neighbourhood has been critically acclaimed as a major success story in urban planning. It has become a model for the design and planning of new neighbourhoods across North America. The apartment buildings and townhouses in the St. Lawrence neighbourhood were designed by some of Toronto’s most accomplished architects. The one consistent feature in these designs is the use of red brick exteriors on all the homes. Private and non-profit housing, market rental buildings, and luxury condominiums all co-exist here. 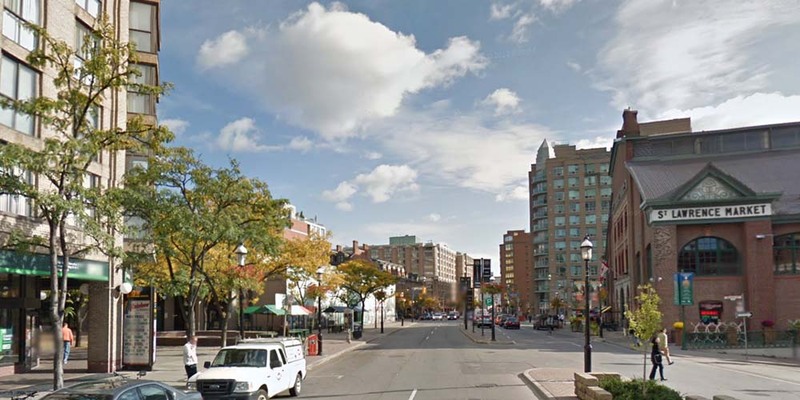 The Esplanade, which runs through the middle of the St. Lawrence neighbourhood, contains retail stores and services that meet the day-to-day needs of the St. Lawrence residents. The Esplanade’s restaurants, bars, and specialty stores also appeal to tourists as well as Torontonians from other neighbourhoods. St. Lawrence residents have the luxury of being able to walk to the famous St. Lawrence Market, a food emporium with over 200 vendors again attracting shoppers from near and far. Stroll through this Toronto landmark and be entertained by live performers, enjoy a vast variety of prepared foods, and purchase everything from fresh seafood to farm fresh eggs and organic chicken. Shopping at this market dubbed the best food market in the world by National Geographic is an experience not to be missed. The South Market is open all week long while the North Building, also known as the “Farmers’ Market”, is open only on Thursdays and Saturdays. 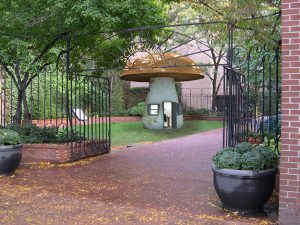 David Crombie Park is a multi-faceted linear park that runs through the centre of the St. Lawrence neighbourhood, along The Esplanade. This park includes pretty strolling and sitting gardens, a waterfall, a handball court, and a basketball court. The St. Lawrence Community Recreation Centre is located on The Esplanade. This modern facility includes squash courts, a swimming pool, a gymnasium, a piano room, a weight room, and a games room. Union Station is within walking distance of the St. Lawrence neighbourhood. TTC, Go Transit and Via Rail services operate out of Union station. The Gardiner Expressway, Lake Shore Boulevard and Don Valley Expressway are all conveniently accessed within minutes of the St. Lawrence neighbourhood. St. James Cathedral is the majestic backdrop for this site. Planned as a formal garden, there are many wedding parties taking advantage of the beautiful garden displays in the heart of downtown. 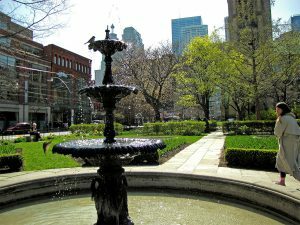 Berczy Park is the area between Wellington and Front Street that contains a large fountain and tables and chairs for lunch and lounging. 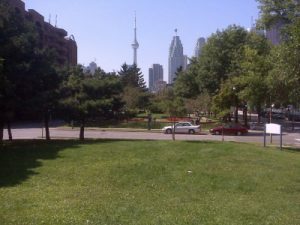 A 1.6 hectare park south of Front Street between Jarvis and Berkeley Streets featuring a ball diamond, a basketball court, a dog off leash area, two children`s playgrounds and a wading pool.